Enjoy Way2SMS Free Mobile Recharge. Way2SMS is World’s Largest Personal Messaging Community. If you send SMS very often to your friends and family then you should be the part of an online Free SMS providing Sites like this one and get rewarded to do so. So start earning Way2sms Free Mobile Recharge by registering at the link below. Communicate more for nothing. Free SMS to Any Mobile. Send Free SMS to any Mobile network in India. Fastest Growing portal. Over 25 million users with close to 24000 new users a day. Chat while on Way2SMS. Recharge more for nothing!! Assured Free Recharge. Download some cool apps & earn upto Rs. 8 daily. Get assured recharge when you login with your Gmail & Yahoo! mail everyday. Register & Get free recharge. Register at sponsor’s site and get Way2sms free mobile recharge! Everyday! Get Unlimited Recharge. Get unlimited recharge by inviting your friends. Truly a made for India site. Global Reach, Any time. Covering over 209 countries & 805 networks across globe. International SMS, Made Easy. Stop worrying about your mobile bills & start sending SMS! Connecting Worlds Apart. Cherish with your loved ones wherever they are! 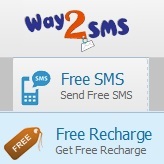 Way2SMS Free Mobile Recharge helps users to earn free recharge by sending SMS to any mobile in the country. Sending messages from Way2SMS is Free , easier, and personal; above all messages are delivered in just few seconds.Every day, millions of SMSes are being sent via Way2SMS. The numbers are growing rapidly. They are not only saving money to millions of way2sms users, but are helping over 1800 non profit organizations to communicate to their volunteers. Their service is helping Hospitals, Schools, Police departments, Revenue divisions, agricultural departments and other government bodies across various states in the country. So get your mobile recharged through Way2sms Free Mobile Recharge. Way2sms is the best free mobile recharge website.